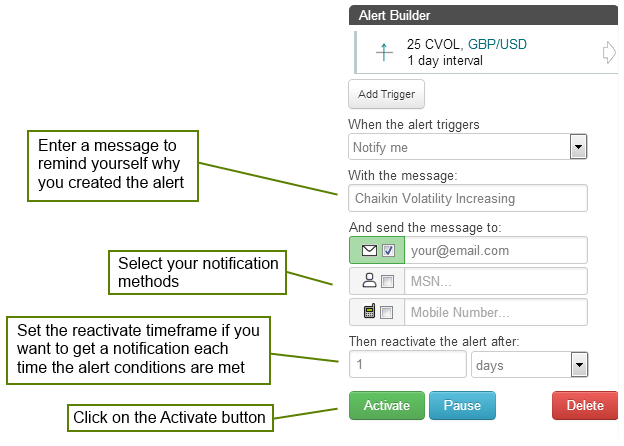 Use timetotrade to set up alerts that will execute trades, or notify you by email or mobile phone as soon as your Chaikin Volatility investment conditions are met. You can set up Chaikin Volatility alerts to execute trades, or notify you, when the Chaikin Volatility is increasing; if Chaikin Volatility falls off below a level; create alerts that combine Chaikin Volatility with other indicators such as the MACD. 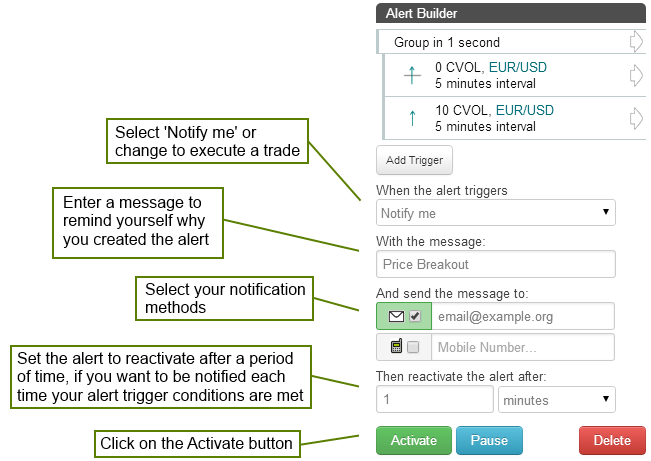 You can also quickly backtest your alert based trading strategies. You can set up alerts to execute trades, or notify you, for example when the Chaikin Volatility rises above 30, falls below 70, breaks-out or pulls back. You can combine the Chaikin Volatility if other indicators, such as the Moving Average to create multi-condition alerts. 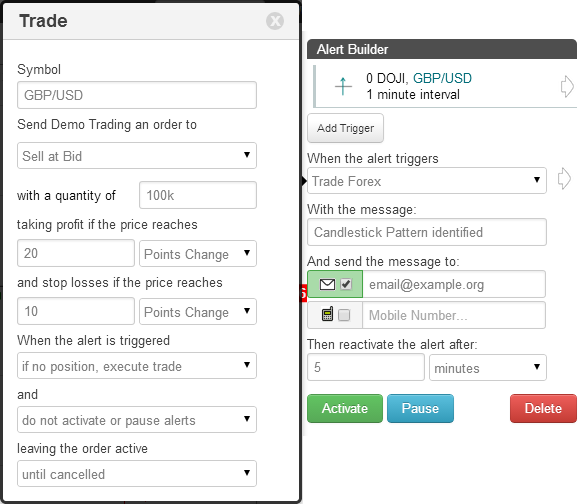 To create an alert, go to the timetotrade CHARTS page >> , and enter the ticker symbol for the stock or currency pair you wish to follow. Use the chart settings to add the Chaikin Volatility chart and adjust the Chaikin Volatility parameters. 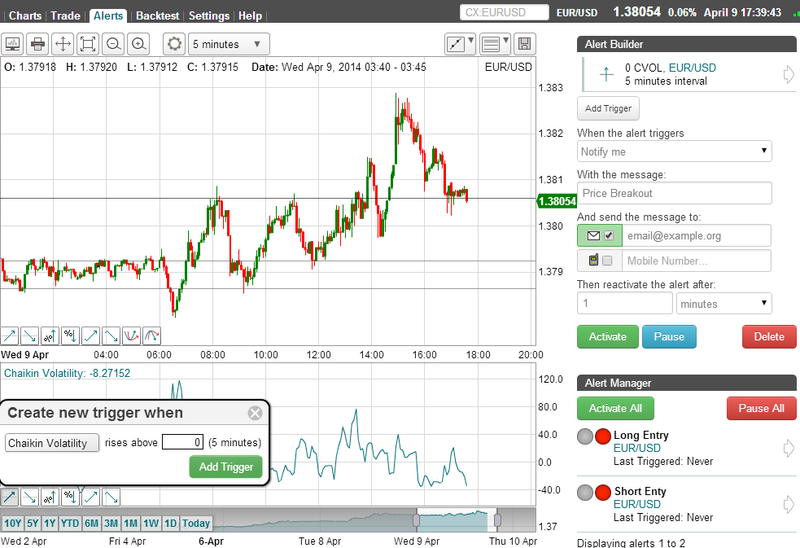 You can adjust the default values and interval parameter values to find the best fit between price movement and the Chaikin Volatility indicator. The default period Chaikin Volatility parameters can be changed to suit your trading preferences using the chart settings. To create a Chaikin Volatility Alert, just click the Alert Trigger button in the bottom left of the Chaikin Volatility chart. There are no programming languages to learn, no macros or complex formulas for you to write. 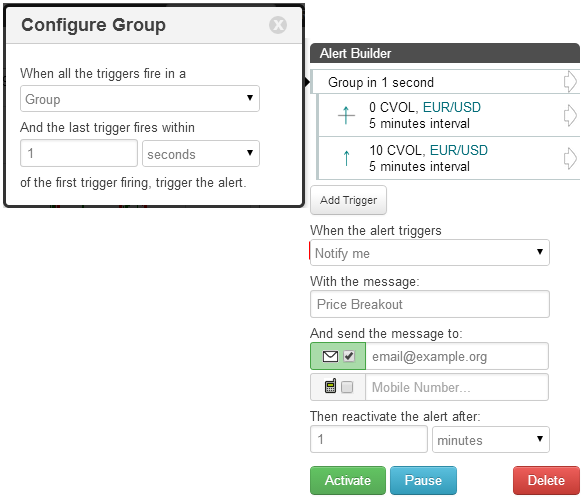 Just click a button, enter your parameters, "add the trigger" and "activate" and your alert is created. Simple! Rising Threshold Alert Trigger, is triggered when the value of the Chaikin Volatility rises above a specified value. Falling Threshold Alert Trigger, is triggered when the value of the Chaikin Volatility falls below a specified value. Break-Out Alert Trigger, is triggered when the Chaikin Volatility increases by a specified value within a the selected interval period. Pull-Back Alert Trigger, is triggered when the Chaikin Volatility decreases by a specified value within a the selected interval period. Percentage Break-out Alert Trigger, is triggered when the Chaikin Volatility increases by a specified value within a the selected interval period. Percentage Pull-back Alert Trigger, is triggered when the Chaikin Volatility decreases by a specified percentage within a the selected interval period. 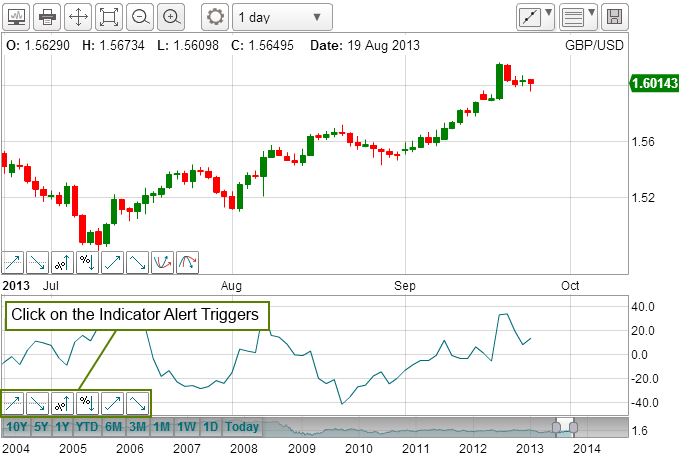 Above Alert Trigger, is triggered when the Chaikin Volatility is above a specified value. 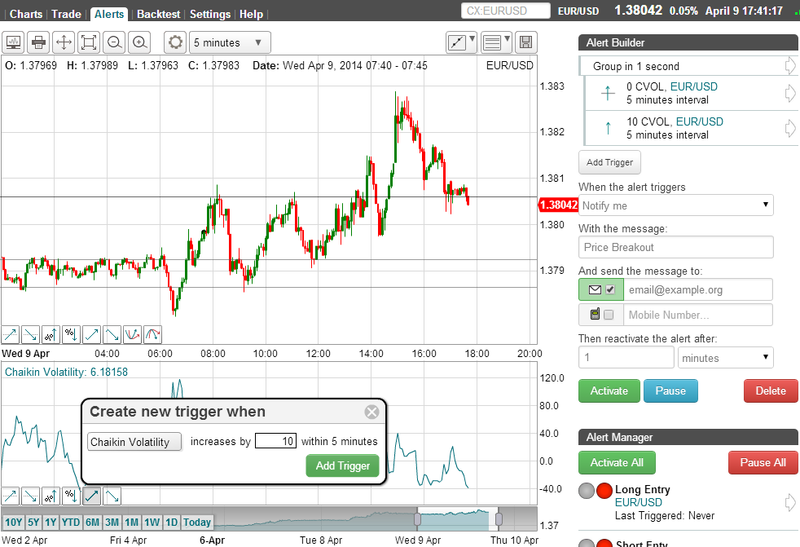 Below Alert Trigger, is triggered when the Chaikin Volatility is below a specified value. Positive Crossover Alert Trigger, is triggered when the Chaikin Volatility rises above / crosses over another indicator, price, a specified value or trend line that you have drawn on the chart. Negative Crossover Alert Trigger, is triggered when the Chaikin Volatility falls below / crosses under another indicator, price, a specified value or trend line that you have drawn on the chart. 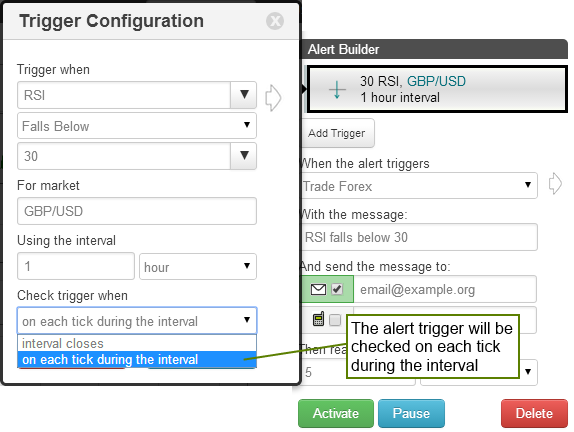 To create alerts if the Chaikin Volatility falls below a threshold or increases or decreases by a fixed amount or percentage, click on the other alert trigger types on the chart and repeat the process. 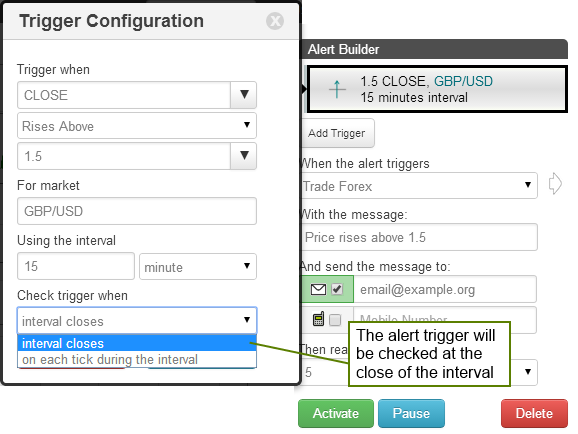 Alternatively click on the 'Add Trigger' button in the 'Alert Builder'.